Hi Friend and loyal customers! Confectionery Cake Shop has closed its doors this week (Sept 1st 2013) after three wonderful years of serving delicious cake and cupcake creations to the metro Twin Cities area and southern MN areas! I have always been a small shop and primarily work alone, so since my husband and I are expecting our first family member to join us very shortly, I have decided to be a full time parent. If I may recommend a wonderful shop or four to help you with your local cake needs, please do not hesitate to contact: The Perfect Day Cakes in Owatonna, Cake Walk in Northfield, Queen of Cakes in Edina, and Cocoa & Fig in Minneapolis. Thank you once again for your support and enjoy your day! Sprinkle a little Joy on your Holiday Treats! There’s something so special about baking together during the holidays. Whether you’re baking up a favorite cookie recipe, sugar cookies or a really fun gingerbread house, I bet your kitchen is filling up your home with the familiar scents of comfort and joy. To make your holidays extra special this year, try topping your sugar cookies or cupcakes with the new line of gourmet sprinkles from Confectionery Cake Shop! They’re perfect for dressing up your already sweet treats and adding an extra touch of goodness to them! 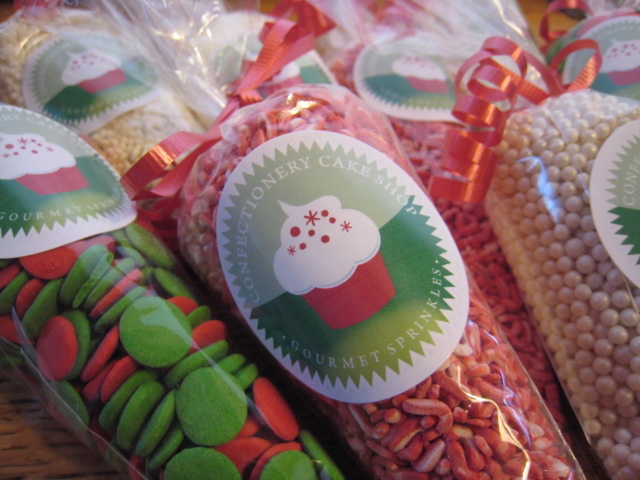 They come an a variety of options, from jumbo red and green sprinkles to teeny tiny white nonpareils and each package is only $2.95! Where can you pick up these lovely little decorative candies? You can shop for them at Sweet Spot Candies in historic downtown Faribault, MN or you can pre-order them by emailing confectionerycakes@gmail.com. Shipping is an option… look for the etsy posting soon! Meet Minnesota’s Best Wedding Photographers! You don’t always need an award to prove that you’re the very best, but if you ask Graddy Photography to show you a couple of awards, they will certainly be able to. Even though they were recently awarded the MN Bride Magazine‘s Best Photographer of 2011, Justin & Chrissy Graddy definitely don’t let it go to their head. They are personable and down to earth photographers whom I met at a friends wedding a few weeks ago. The photos from that wedding turned out so beautiful so when it came time for a few product cake shots for an upcoming ad that will run in the Faribault Daily News‘ Wedding Journal as well as Girlfriend Magazine‘s February issue, I knew who to call. When I walked in, I was graciously greeted and given a tour. Their studio is converted from an old theater in the heart of New Prague. It has a small town feel, but was a wonderland modern equipment, hip and stylish backdrops, vintage furniture, and creative props. The entry area had a gallery with some of the finest photography in the Twin Cities and Minnesota, okay fine, the Universe. I often joke that I treat my cakes as if they are people and Graddy’s also seemed to treat them in the same way, having them rest on stools, benches and couches. They were gentle with the cakes and knew how to handle them so they wouldn’t become damaged. The shoot went smoothly and the portraits turned out fantastic. It was a stress-free experience for me, which is what we all hope to feel when it comes to hiring a photographer. 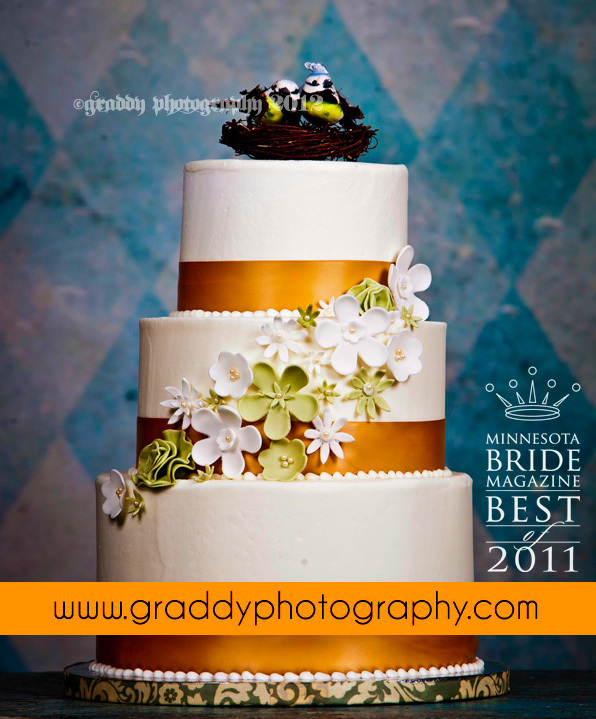 Keep an eye out for Graddy Photography. If you’re planning on getting married in 2013, I suggest calling them now as they will book up fast. When you see their portfolio, it’s no wonder brides want them to capture their wedding on camera. You can find a link to their website to the right of this post in my preferred vendor links list. Enjoy! * The best way you can support local wedding vendors like us is to please take a moment to vote for us for ‘MN Brides 2012 Best of“. You need to vote for at least six vendors for your vote to count, but you do not need to fill out the whole form. Cakes are listed in the #40s. Thanks! 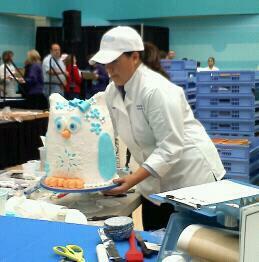 Lifting the Giant Owl Cake! What would be a better way than to kick of Cake Week than with the 5th Annual Upper Mid-West Bakery Association’s Ultimate Cake Competition at the Mall of America? Confectionery Cake Shop’s owner, Laura O’Connor (yes, I’m writing this in the 3rd person for kicks) competed in a birthday cake competition with 11 other awesome decorators from all over the mid-west (and South Carolina). All of the contestants had 90 minutes to build, sculpt and decorate a birthday cake out of a sheet cake, using buttercream and fondant that was provided by sponsors. It was a mad rush of controlled creativity and skills on the floor that day in order to get your cake and 24 matching cupcakes finished as well as carried over to the judging table about 75′ away! I only had to stop one time to set mine down because it was so heavy! The winners took home cash prizes and trophies. While Confectionery Cake Shop did not place this time, watch out because there are lots of other opportunities to compete coming up! The next one is in February at the National Convention! Stay tuned. There was also a Wedding Cake Competition that day where contestants had to build a 5 tier wedding cake in 3 hours (which was a serious challenge.. perfection takes time, people!) and carry it over to the judging table. Tension ran high as teams of 3 or 4 carried over their 50-60lb cakes to the tables! But the real icing on the cake (yes, I, too, hate bad puns, but I’ll let it go this time) is that Buddy Valastro from Cake Boss is going to be in Minneapolis tonight! He’s also going to be at the Mall of America for his book signing today at around 11:30am near Barnes & Nobel (or so I heard). I have tickets to the show and can’t wait to see him tonight! Weee!! It’s a cake shop owner’s dream to be as awesome as Buddy and his team. I can’t wait to hear more about how he does it! How SWEET It Is – Cupcakes at the Sweet Spot! Did you know that you can pick up a fresh baked Confectionery Cupcake each and every day that the Sweet Spot in downtown Faribault is open (Tues-Sat)? This week is a big week for Sweet Spot owners, Marie and Kerry McCarthy as their son Zack (who also works at the shop) is getting married tomorrow to the lovely Camille (who ALSO works at the shop)! Talk about a family business! 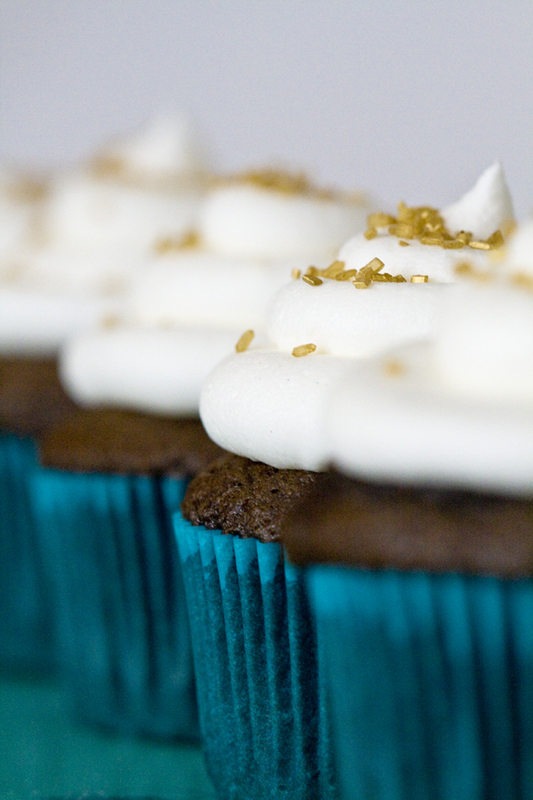 In honor of their wedding, you can find special wedding decorated cupcakes in Tiffany Blue Buttercream (I know!!) right there in the store. There are plenty of cupcakes to go around, but only a limited amount of wedding ones, so stop by early and pick up a box of 4 cupcakes to bring to work today! They are open from 8am-5pm and are located at 209 Central Ave.
Don’t forget about the Cupcake Cravers Club, a Sweet Spot Candies exclusive. It’s a punch card where you get your 5th cupcake free!! See store for details. Okay, there’s a really big wedding tomorrow… so I’ve got to run and pick up some fresh ingredients and then head on over to the kitchen. 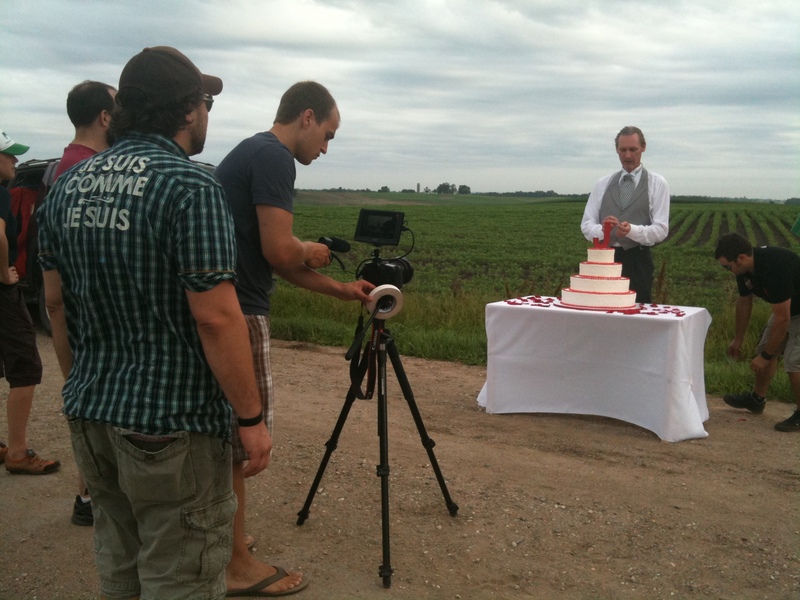 Photos of the McCarthy wedding cake… coming soon! 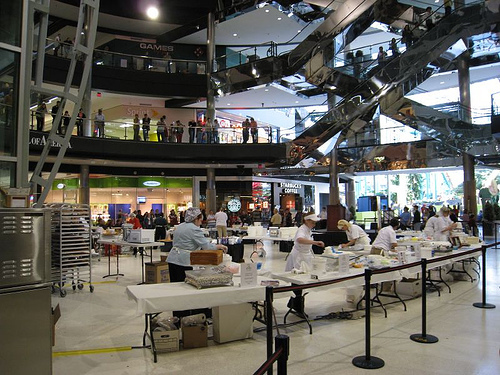 It’s time for the 5th Annual Ultimate Cake Competition at the Mall of America and you’ll never guess who one of the main competitors will be… okay, you probably guessed it correctly since you’re reading this post! That’s right, Confectionery Cake Shop’s very own Laura O’Connor has been selected to compete on Sunday, November 13th at the Patio of Nickelodeon Universe in the Mall of America from 11am-12:30pm. 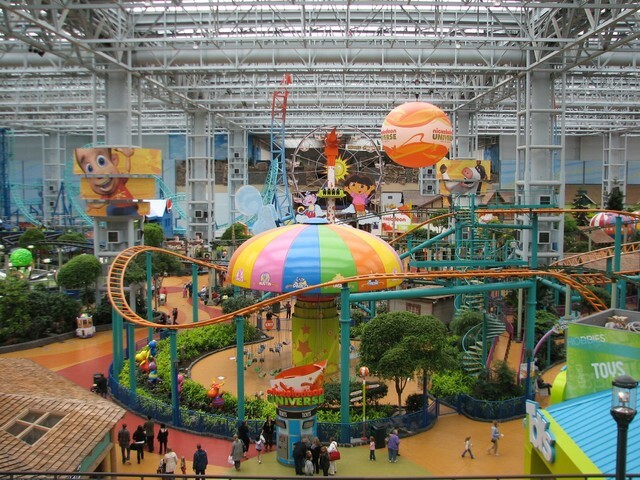 Decorators will compete in a timed competition before a live audience at the Mall of America. In the birthday cake competition (where Confectionery Cake Shop will surely shine), decorators will decorate a cake and 24 matching cupcakes. They will have the option of doing a sheet cake or a sculpted cake using their choice of icing. This Winter Wonderland themed contest is going to be a hoot and you do not want to miss it! With only 90 minutes to build and decorate a creative 3D cake, who knows what could happen! Come cheer on Confectionery Cake Shop and watch other cake artists complete some pretty amazing cakes in a short amount of time! Craving more details, click here. Craving cake, well, place an order already! Don’t forget that Buddy from Cake Boss will be at the Mall of America and Minneapolis that following Tuesday, on tour! It’ll be such a great week to celebrate cake! PRWeek Magazine & Carmichael Lynch Spong Congratulate… Julie! When Julie Batliner from Carmichael Lynch Spong in downtown Minneapolis was named one of PRWeek’s 40 Under 40, they wanted to do something special to celebrate. She likes cake, so they called Confectionery Cake Shop to make one. She likes fireworks too, so they called their friends who blow things up. Here is the awesome video congratulating Julie on this awesome achievement. It was such a fun experience to be on set during the making of this short film. Thanks so much to Carmichael Lynch! It’s makes for an interesting way to celebrate with cake! The hole carved out for the device placement.